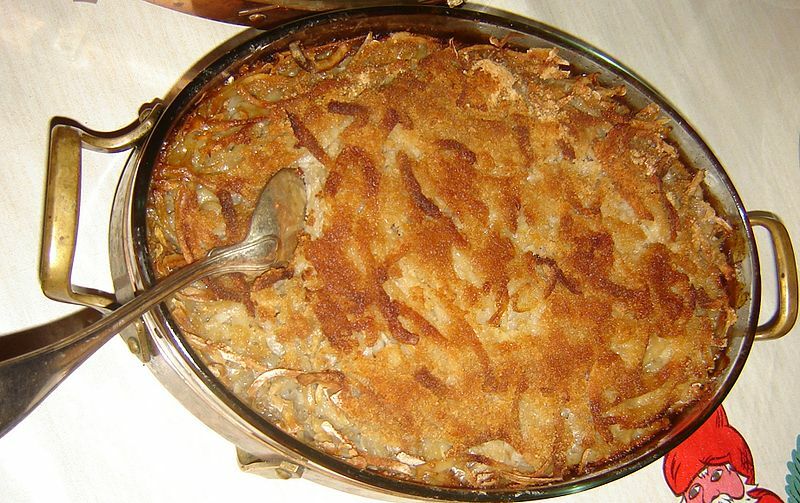 Janssons frestelse ("Jansson's temptation") is a traditional Swedish casserole made of potatoes, onion, pickled sprats, bread crumbs and cream. The potatoes are grated and layered in a roasting tin, alternating with the sprats and chopped onions in between. Salt and pepper is put over each layer, then cream is added so that it almost fills the tin. It is finally baked in an oven at 200 °C for about one hour. The recipe is often mistranslated into English, using anchovies instead of sprats. This is because sprats (Sprattus sprattus), pickled in sugar, salt and spices, are known in Sweden as "ansjovis" from as far back as the 17th century, while true anchovies (Engraulis encrasicolus) are sold in Sweden as sardeller (sardelles). The name has often been claimed to originate with the opera singer Pelle Janzon (1844-1889), remembered as a gourmand. According to a different view, the name was borrowed from the film Janssons frestelse (1928) with the popular actor Edvin Adolphson. The dish is also very popular in Finland as "Janssonin kiusaus" (also means literally "Jansson's temptation").